Digital media furnish numerous opportunities to improve German language teaching – provided the teachers themselves have the required media literacy. An interview with Janek Scholz, who trains GSL teachers in the use of new media. Mr Scholz, how do you assess the media competence of GFL/GSL teachers? It’s very different – if for no other reason than because different training routes lead to the profession. A GFL/GSL study program in Germany usually includes the topic “new media”. But there are also teachers of German as a foreign language or German as a second language who did their studies abroad, or newcomers from other professions who, for instance, take the supplementary qualification of the Federal Office for Migration and Refugees (BAMF) for integration courses. You teach the module “New Media” at BAMF. What sort of previous knowledge do the teachers-to-be in these courses have? Again, very different. Many participants use the internet only rarely and are rather media-shy. Others are familiar with many different programs, technologically fit and curious. To do justice to them all I have to work with considerable internal differentiation, to address the different levels of preparation in the course. That’s often difficult. What topic do you treat in the course? Janek Scholz | Photo (detail): © Private First of all, I show media novices the supplementary online textbook material, the integration course accompanying service ich-will-deutsch-lernen.de (i.e. I want to learn German) and the website where they can make exercise sheets. To the experienced I present further tools: at learningapps.org, for instance, they can create exercises for tablets and smartphones. In this part of the supplementary qualification, I also like to show how they can integrate smartphones and tablets into their teaching, make short films with them and create our own comics and photo stories. What’s important is that the use of media always have an added educational value and foster learning in a special way. A good way to integrate media is to ask participants to create a podcast, a kind of radio broadcast. They should be given enough time for preparation and record their contributions several times before submitting them. You can then work with the podcast over several lessons and it can even be used as a source text for new tasks. Such an action-oriented project fosters the autonomy of the learners and would be unthinkable without the help of new media. Isn’t this new type of teaching a big challenge for some learners? Yes, of course! Because the participants come from different learning traditions. If they’re accustomed to chalk and talk teaching, this kind of teaching is naturally completely new to them. Teachers therefore have to lead participants to cooperative tasks and work with new media very carefully. Moreover, media literacy of those learning German is very different. You can’t expect them to accept right off a challenging new method such as recording a text on a smartphone or a tablet in a group working phase. You have to start early with small tasks – for example, research work on the internet at level A1. How do the prospective teachers in your courses respond to the possible applications of new media? Most are very interested, both beginners and the experienced. They’re enthusiastic about the possibilities, but many also say that in their classrooms the infrastructure is lacking, that there’s no corresponding equipment. Some adult education centres have only an overhead projector – which, it should be said, can be more suitable for certain tasks than is a beamer. You can place transparencies on top of each other and participants can write on them, and these can then be discussed together. This too is media work. What would it take to gain more teachers for the varied use of media? First, of course, the infrastructure would have to be improved. We see this in state schools: if tablets are available, the teaching staff uses them in lessons. We also need more training opportunities for teachers. In the supplementary qualification course we have only four teaching units on new media – that’s not enough. It lets me give an overview, but doesn’t let me go into detail. We need courses for different levels of media skills, in which the future teachers can also try out things for themselves. Where is there already such training? The Goethe-Institut has long been active in this area – for instance, with the online advanced training “Unterrichtsgestaltung mit digitalen Medien” (i.e. Teaching Structures with Digital Media). At private educational institutions there are pay one to two-week advanced training courses in which teaching designs for the use of diverse media are also developed. Telc, a subsidiary of the German Adult Education Association, offers a blended-learning course entitled „Modern unterrichten – Sprachunterricht 2.0“ (i.e. Modern teaching – language teaching 2.0) which treats concepts of e-learning. Some opportunities already exist, but most presuppose a certain media affinity and a certain level of previously acquired media skill, which by no means all teachers possess. 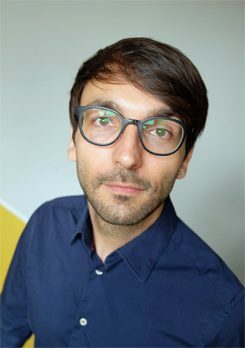 Janek Scholz (born 1987) has been responsible, as a staff member of the Research Area in Teaching Methodology for German at the Institute for General and German Literary Studies at the RWTH Aachen University, for the in-service training supplementary qualification in German as a second language (GSL). He has also taught the supplementary qualification course for GSL teachers for the Federal Office for Migration and Refugees (BAMF), including the module on “New Media”. is a freelance journalist and GSL teacher.